By David Veselka on May 15, 2017 - 5 Comments. Now over three years into the current console generation, the PlayStation 4 has a larger presence than ever in the console eSports scene and has become the home of popular first-person shooter games like Call of Duty, Battlefield, and Destiny. So, it’s about time that gamers on Sony’s platform were introduced to a more serious eSports controller that could keep up with the rapid growth of professional gaming on PlayStation. 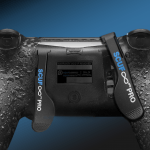 Scuf Gaming, now a household name in pro gaming circles, answered that call this past Spring with two brand new devices. 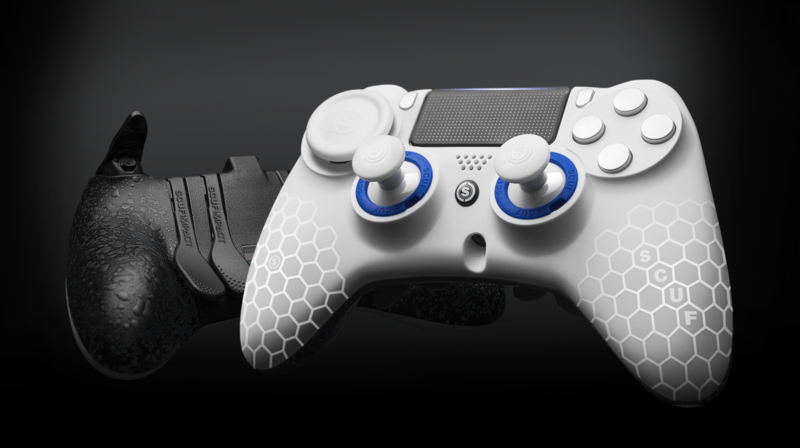 The Scuf Impact is a bold new take on the PlayStation game pad with game-changing features and a winning look and feel. Meanwhile, the Scuf Infinity 4PS Pro is another forward-looking take on the more traditionally-shaped DualShock 4 design. 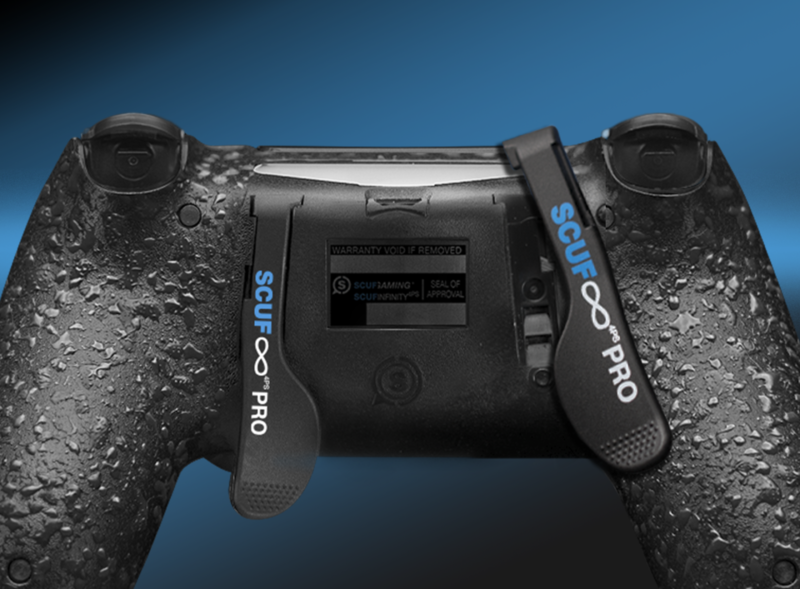 At first glance, the Scuf Impact’s overall design is noticeably wider than the typical DualShock 4 shape or the Scuf Infinity 4PS Pro. The sticks and face buttons between both controllers will still line up when compared side-by-side, but the Impact’s grips extend further out to the sides, slightly altering the grip angle. The Xbox crowd will feel right at home here while the Sony folks will certainly appreciate the longer reach to the thumbsticks, which, in my experience, promotes better thumb placement. That’s right, no more thumbs running into each other when both sticks are tilted inward. Combined with the custom fit on the backside of the controller and the textured grip, the Scuf Impact is probably the most comfortable controller I’ve ever held. In addition to providing more space for your thumbs, the Impact’s wider design also now fits four paddles instead of two. In my hands, the tips of the outer-most paddles sit precisely where my middle fingers rest so actions like jumping or crouching are just a minor finger twitch away. That said, the paddles are still stiff enough that I didn’t need to worry about any accidental presses. Meanwhile, the two inner paddles are angled so that they only need to be flicked toward the center of the controller to activate and don’t need to be pressed in all the way. 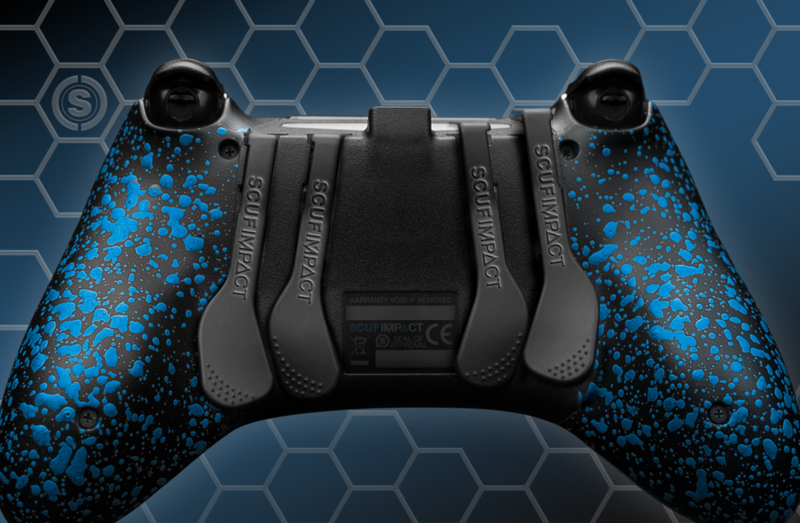 On top of being completely removable and remappable with the included EMR Mag Key, the paddles are also recessed into the back of the controller, which is a great design improvement in general and is shared between both the Impact and the Infinity Pro. 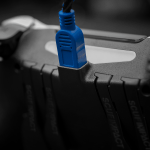 If they do break, Scuf has you covered in the first 12 months with a neat paddle replacement policy. Diving deeper into the features on the backside of either controller, you’ll notice a cleverly placed trigger stop mechanism underneath each trigger that rotates 360 degrees, providing two different stop positions, and is easily adjusted with a Scuf Key. The trigger covers are now also removable, revealing an adjustable hair trigger mechanism that lets you really dial in your desired amount of “play.” As you can imagine, this gives aiming and firing your weapon in any shooter game a noticeably snappier feel, responding to more minute movements. Attachable trigger extensions also offer alternative positions for your trigger fingers, which are also quite comfortable, I might add. Overall, most moving parts on both the Impact and Infinity Pro, especially the new triggers and paddles, have that satisfying “click” and “snap” that give the impression of a solid, well-built game pad. 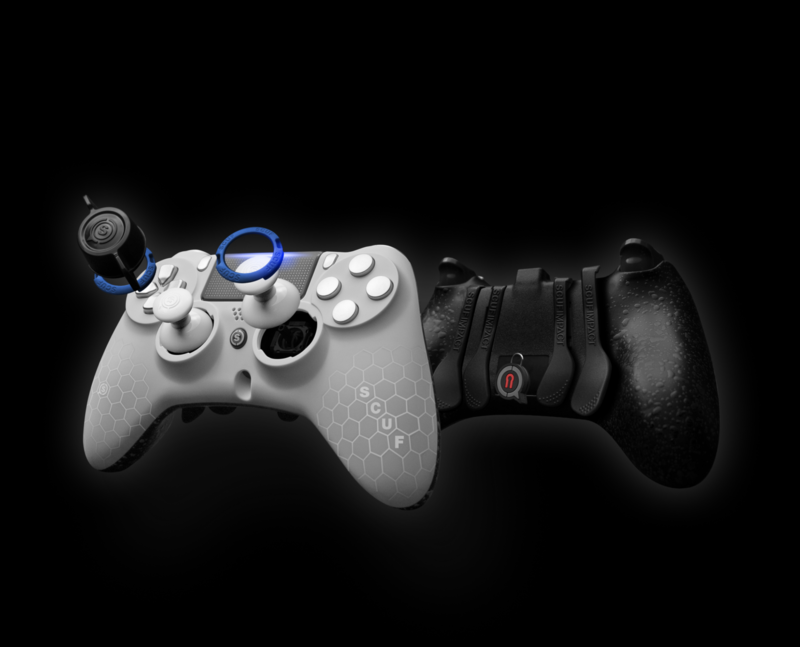 On the front, the Impact and Infinity Pro both adopt the same replaceable thumbstick design found on Scuf’s more recent Xbox controllers so sticks can be swapped out and customized on the fly. The rings that lock the sticks in place also provide a more lubricated feel over the standard controller and really smooth out any movement along the edges. On that note, the domed sticks that came loaded in my controller felt exceptionally grippy — a huge improvement over the default DualShock 4 thumbstick. A few smaller but much appreciated design improvements on the Impact include a recessed headphone jack and covered USB connection for longer lasting components and a sturdier feel. 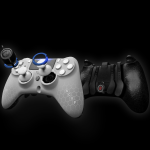 You can watch tutorials on paddle swaps, thumbstick changes, electro-magnetic remapping, and hair trigger adjustments for both the Impact and Infinity Pro controllers over on Scuf Gaming’s official YouTube channel. If you decide to build you’re own, you’ll find an impressive selection of colors and customization options, including new tints on the Scuf Grip and shoulder buttons. 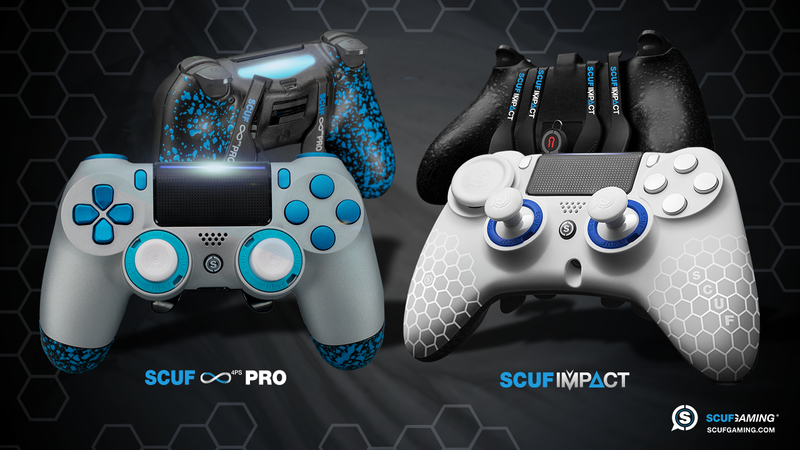 Starting prices for the Scuf Impact and Infinity Pro are within reason, coming in at $139.95USD for the Impact and $129.00USD for the Infinity Pro. A fully-loaded controller from the Spectrum Collection, including remappable paddles and any choice of thumbsticks and grips, is $189.95USD for the Impact and $179.95 for the Infinity Pro. While I only have positive things to say about the significant improvements made to the Scuf Infinity 4PS Pro, the fit and feel of the Scuf Impact truly is a dream. It is, in my opinion, the pinnacle of game pad design for consoles, combining a more comfortable grip with features that would satisfy any eSports enthusiast or professional gamer. It also just so happens that it’s fully compatible with PC and is a fantastic choice for games that might work better with a controller. Hats off to Scuf for this one. 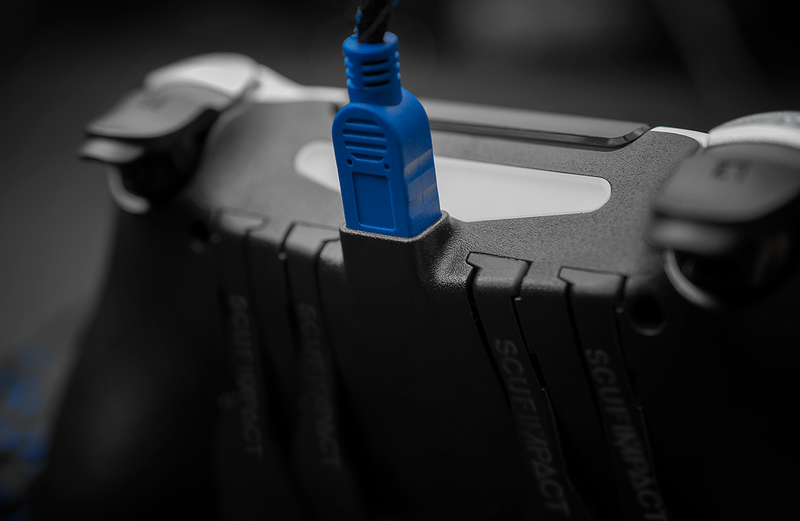 The Scuf Impact might just be the only controller you’ll ever need. 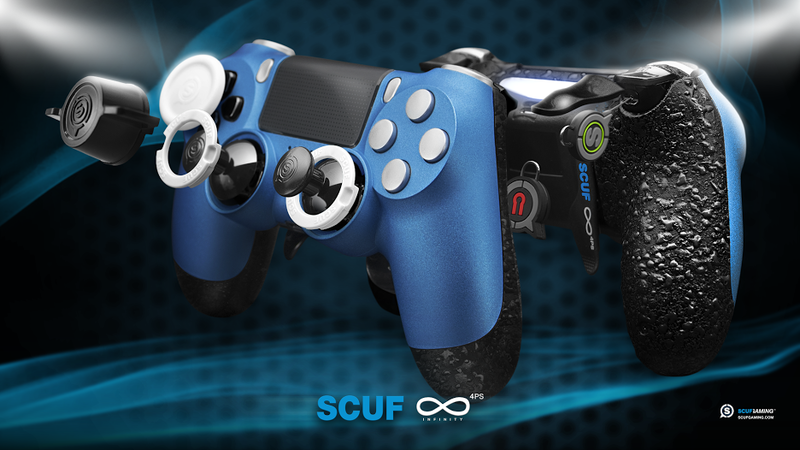 Now fully modular, the Scuf Infinity 4PS Pro is the ultimate solution for PlayStation gamers more comfortable with the traditional DualShock 4 feel. Check them both out at ScufGaming.com. 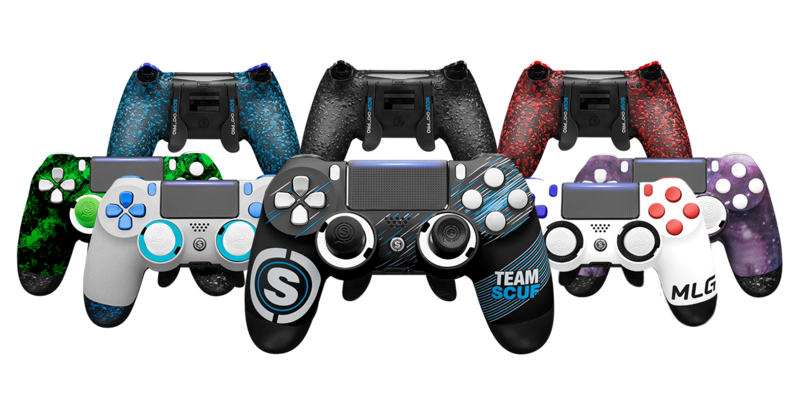 This review was based on early review units of the Scuf Impact and Scuf Infinity 4PS Pro, provided courtesy of Scuf Gaming.